Soon Koh says goodbye for the last time as Andrew’s casket is prepared for cremation. SIBU: No words can describe a mother’s sorrow over the death of their only son, but Datin Sri Pauline Leong made the feelings palpable through a short poem she read at the funeral service of her late son Datuk Andrew Wong Kee Yew here at Nirvana Memorial Park chapel today. Leong was the first person to discover Andrew’s unconscious body lying on his bedroom floor on Sunday night. He was the only son of Second Finance Minister Dato Sri Wong Soon Koh and Leong. “I would give my life to have you back,” she said, reading the first line of a narrative poem titled ‘Mother and Son’ that she penned, dedicating it to the late Andrew and to all parents who have lost their children. “You are the first person who loved me, and you are the first person I loved. You were always there when I needed you and you always knew when I needed a hug. I am here for you now, mum, I am in your heart and in your soul, I did not take your heart with me, in fact I left mine with you to hold,” was an excerpt from the poem that Leong read as she fought to hold back tears. “Don’t worry Andrew, you may go in peace, don’t worry about us, you will always be loved by all of us and you will always remain in our hearts. We love you, we all love you,” she concluded. Afterwards, the family bid their last goodbyes as Andrew’s casket was sealed for cremation. 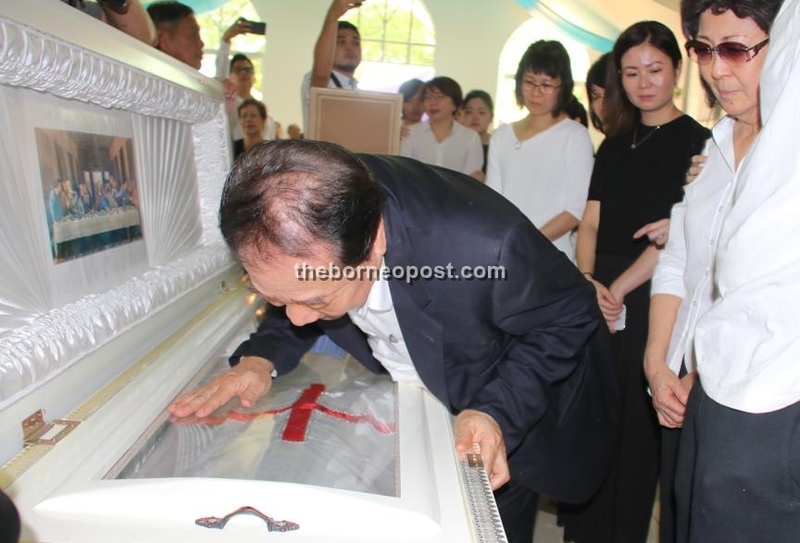 Soon Koh took a few moments to whisper his goodbyes to Andrew, holding his hand to the casket. Andrew’s son, Sean Wong, was also seen comforting his grandfather as they did their best to retain their composure. His ashes will be kept at Nirvana Memorial Park.